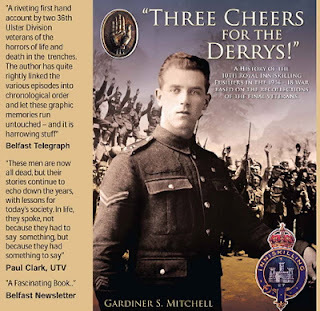 Last night I began to read 'Three Cheers For The Derrys' written by my good friend Gardiner Mitchell. It's a history of the 10th Royal Inniskilling Fusiliers in the 1914-18 war. Based on the recollection of the final veterans. Its graphic style and first hand accounts are compelling reading. This book is a must for anyone who has an interest in finding out, what life was really like in the trenches. Author, Gardiner S Mitchell, explains the reason for the book. This clip is a link to a MaidenCityFestival You Tube clip.